Provides personal and professional characteristics of dentists in private practice, including current employment status, number of dentists in the practice, time spent in the practice, perceived workload, dental office characteristics, and length of appointments and wait times. Also includes patient statistics, such as age and gender, insurance coverage, and number of visits. Contains trended data back to 1990. This is a downloadable report, which is also available free of charge to ADA members at www.ada.org/freereports . 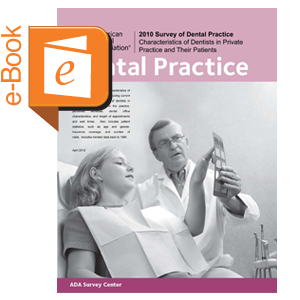 Our most recent release of this subject matter is available at http://www.ada.org/en/science-research/health-policy-institute/data-center/dental-practice.